Using Sendgrid and our plugin you can send transactional and marketing emails from Sitelok with confidence. The mail servers provided with most hosting accounts are unreliable, restricted and often blacklisted so Sendgrid are trusted by small startups and many big name sites to deliver over 40 billion emails every month. We have used them for a while now and found the service to be fantastic. As well as sending emails the plugin supports tracking so you can see when they are delivered, opened, bounced and even which links are clicked, right from Sitelok. 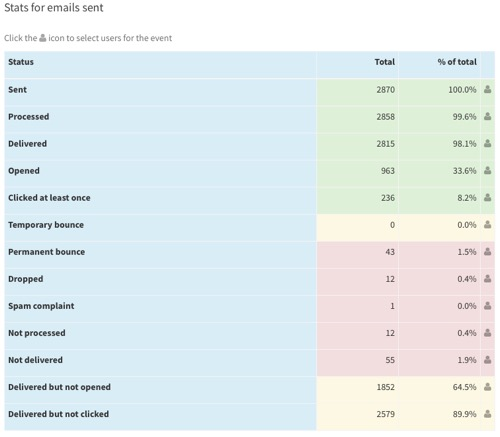 Each sent emails status can be seen in the log and user recent activity. Our statistics page shows detailed information about bounce rates, opens, specific links clicked etc. Stats can be for all emails sent in a certain period or for a specific email campaign. It's a great way to see how well marketing emails are received and how users interact with them. Here's how it works. Its also possible to select all users who opened the email or clicked a specific link in the email making it easy to follow them up with another email. To do this just click the user icon next to the link or email stat you are interested in. The Sendgrid plugin costs $19.95 (plus VAT where applicable) and requires you to have a free or paid Sendgrid account and Sitelok V5.0 or above (V5.5 is recommended for all features). To download the manual or to purchase please click here.